This article is 3104 days old. 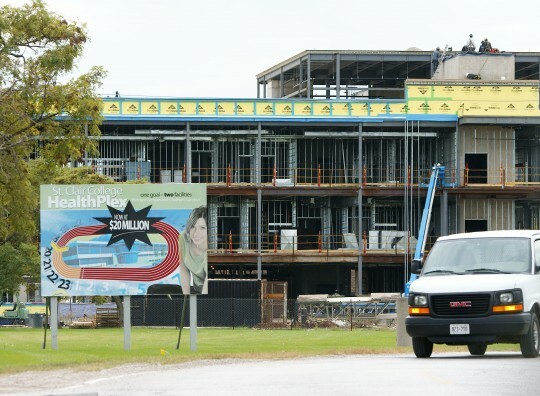 St. Clair College’s Centre for Applied Health Sciences is well on its way toward opening day, and the start of a healthier an health-industry focuses main campus. Work crews are building the new Health Sciences building which will sit beside a future 75,000 square foot fitness, athletic and recreation facility to support the healthy needs of its six-thousand full time students, and 20,000 part time students. The future facility, once complete, will feature a gym (fitness club), a unique elevated running track, and a triple gymnasium. The Health Sciences building will feature offices and classroom space to, as the St. Clair website puts it “establish St. Clair College as a leader in preventative health care”!